custom cleaning equipment, designed around each of our customer's unique cleaning requirements. We also provide rinse water purifying equipment that will close loop your rinse stations and provide clean, deionized water in your final rinse. Our material handling systems can be configured for manual, semi-automatic, or programmable configurations. or an automated cleaning bench, we will be pleased to analyze every aspect of your application and provide you with the most cost-effective solution to your cleaning problem. , sweep frequency ultrasonic power supply, thermostatically controlled heater, and connector cables. All systems are available in frequencies of 25 or 40 kHz. Some sizes are also available in 80 and 120 kHz. Stainless steel stands, covers, filtration systems, and overflow surface skimmers are optionally available for all models.
. Greco Brothers employs immersible transducers, (Diagram B). An immersible transducer is a hermetically sealed stainless steel container which contains a number of transducer elements. These transducers offer the major advantage of versatility in system design. 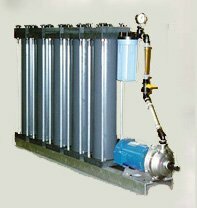 The custom cleaning tank can be nearly any size that is appropriate to the application, and the ultrasonic transducers can be mounted on the bottom or side of the tank to direct and concentrate the ultrasonic energy where it is needed most. Most cleaning applications require that the part be rinsed and dried after cleaning. This can either be accomplished with individual rinsing and drying systems, or in a consolidated cleaning bench. may be placed in line to create the complete cleaning process. Drip guards are installed between stations to keep liquid in the tanks. This approach offers the most versatility. If the cleaning process changes at some point in the future, tanks can be added or moved to accommodate the new process. Consolidated Bench Construction: Greco Brothers cleaning benches offer several advantages over individual stations. Cleaning, rinsing and drying stations are built into a stainless steel frame and wired to a common electrical panel so that the electrical portion of the installation is reduced to one connection. All electrical components are connected to a recessed control panel on the front of the bench. Water inlets and outlets on each station are connected to common feed and drain manifolds to further simplify the installation. 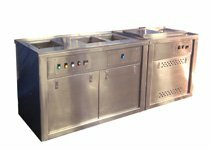 Access panels on the front of the bench make it easy to perform routine maintenance tasks, and a removable stainless steel counter top with a drip-proof lip simplify tank replacement if it should ever be necessary. Cellular Manufacturing Benches: Our CBC style cleaning benches are designed specifically for cellular manufacturing operations and small parts processing. 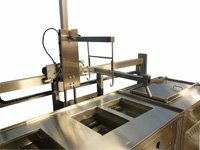 They can be installed adjacent to the manufacturing process or mounted on casters for complete portability. These cleaning systems are available in several configurations, all designed to maximize efficiency and minimize floor space. They are offered with single or multiple rinse stations and can be paired with our Lab Style Dryer, Modular Hot Air Dryer, or a centrifugal spin dryer. Standard compartment sizes are 10” x 12” x 10” deep, 12” x 16” x 12”, and 16" x 20" x 16 deep. As always with Greco Brothers cleaning systems, custom sizes and configurations are also available, as are integral programmable lift systems and rinse water deionizers. Tank-in-Frame Construction: This modular construction style has all the features of the CBC style bench and is used for applications requiring larger or more numerous work stations. 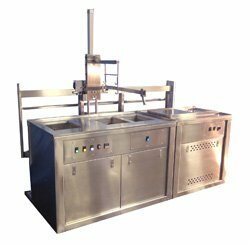 Individual cleaning, rinsing, and drying stations are fabricated and installed in a heavy-duty stainless steel structural frame. Automation: Manually-operated, semi-automatic, or user-friendly, programmable transport systems are available for all standard and custom cleaning benches. Manually-operated and semi-automatic systems are controlled by a joystick on the operator control handle. Programmable systems are provided with a text-screen or touch screen HMI. The automation system is programmed to lift the part from a load table, process it through the precise cleaning, rinsing and drying stages, and drop it off at an unload table - ensuring process consistency and leaving no room for human error. Rinse purification systems are designed to eliminate the need to send rinse water to drain. These systems connect to the final rinse station(s) and circulate the rinse water through disposable treatment media; removing both organic and inorganic contaminants. By continuously removing soap, contaminants, and minerals from the rinse water these recycling systems ensure that the final rinse station produces ultra-clean parts that can be dried spot-free. If the parts have blind holes or are are particularly difficult to rinse, ultrasonic transducers are installed in the initial rinse station. This configuration ensures fluid flow through the tight or occluded crevices to remove any residual detergent or contaminants. 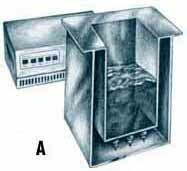 Static Rinses: A static rinse station is inserted between the cleaning station and the first flowing rinse. The resulting detergent-rich water in this station is used to replenish evaporative losses in the ultrasonic; saving soap and extending the resin life of the rinse purifier. Rotating Parts Barrels: These mechanisms are designed to slowly rotate the parts as they are processed through each cleaning stage. They are most useful for processing flat parts, which tend to nest, or to ensure proper draining of parts with liquid-trapping blind holes. Custom Designed Benches: In addition to the standard models listed above, our Consolidated Cleaning Benches can be custom built to include only the cleaning, rinsing and drying stations your process requires. They can be constructed with work stations that are sized and configured to meet your specific requirements. So if a standard system won't do, please call. You will be surprised at how economical a custom cleaning system can be.